a. 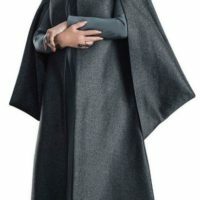 The coat should be made of a very dark grey fabric with a metallic silver sheen. The fabric weave or pattern should give the impression of a neat square design. b. The fabric must be rigid enough that the collar and sleeves stand stiff when worn. The collar and front sections of the coat should be lined with the exterior fabric. c.	The coat features a shoulder seam, mid back seam, side seams, and back horizontal collar seam. There is no collar seam on the front portions of the coat. d.	The coat has a standing collar that hits just under the hairline in back and no more than 1 inch from the bottom of the chin in front. e.	The end of the coat sleeves should angle up from the body, starting 3-4 inches / 7.5-10 cm past the fingertips close to the torso and ending about half way between the wrist and proximal knuckle. The sleeve is folded kimono style and is attached from just under the armpit in front, up over the shoulder and to the lower shoulder blade. The sleeves can be self-lined or lined with black fabric. f.	The coat length should reach or be no higher than 0.5 inches / 1.5 cm off of the floor. a. A light charcoal grey under dress. b. The dress is long sleeved and has no top-stitching around the bottom hem, belt band, sleeves or neckline. d.	The dress features a split neckline, the top of the neckline starts at the clavicle and the split extends down approximately 4 inches / 10 cm. e.	The dress is gathered at the front at empire waistline level. f.	There is a front band 1.5-2 inches / 3.5-5 cm wide at empire waistline level starting under one side breast and extending across the front of the dress and ending at the opposite side breast. g.	The sleeves of the dress end at wrist level and the bottom hem of the dress ends approximately 2 inches / 5 cm from the floor. a. The front of the hair is styled swept back in front with a twisted band across the top of the head. b. There is a bouffant style hair bump at the crown of the head approximately 3 inches / 7.5 cm in height. c.	The front twisted band is hidden on the sides by sections of hair above the ears – these sections are pinned under the bouffant hair in the back of the head. d.	There are two low loose buns pinned to the bottom of the hairline covering the back of the head horizontally. The buns start vertically at the half-way point of the ear and ending at the half-way point of the neck. e.	Naturally-occurring hair color only (brown with a touch of grey recommended); no bangs. If a wig or extensions are used, they must be of high quality and appear like real hair. a. Black closed-toe boots with dark soles. a. Screen accurate gold or bronze ear cuffs that curl around the lower ear lobe and extend up the back of the ear. b. A screen accurate gold or bronze wrist cuff approximately 3 inches / 7.5 cm wide worn on the right wrist consisting of a thin wired effect. The wrist cuff feature a gradual wave pattern. c.	A screen accurate gold or bronze ring with two circular blue stones worn on the right ring finger. d.	A screen accurate gold or bronze blue-teal tone oval ring worn on the left ring finger. (Mainly blue with flecks of other colors recommended). 1) A screen accurate tracking device worn on the left wrist, colored to match visual references and held with a ¼ inch / 0.5 cm black chord. 2) Natural make-up: matte red-brown lipstick, light blush, light brown eye-shadow, and mascara.